This is the second blog post on a paper that will be presented at WSDM 2016 , on metrics of user engagement using viewport time. This work is in collaboration with Dmitry Lagun, and was carried out while Dmitry was a student at Emory University, and as part of a Yahoo Faculty Research and Engagement Program. If the user decides to stay and read the article but reads less than 50% of it, we categorize such a page view as Shallow engagement, since the user has not fully consumed the content. The percentage of article read is defined as the proportion of the article body (main article text) having a viewport time longer than 5 seconds. Note that using 50% is rather arbitrary and used only to distinguish between extreme cases of shallow reading and consumption of the entire article. On the other hand, if the user decides to read more than 50% of the article content, we refer to this as Deep engagement, since the user most likely needs to scroll down the article, indicating greater interest in the article content. Finally, if after reading most of the article the user decides to interact (post or reply) with comments, we call such experience Complete. The users are fully engaged with the article content to the point of interacting with its associated comments. To understand what insights these engagement levels actually bring, we compare them with four sets of measures, by reporting the mean and standard errors between them and viewport time broken down for the engagement levels. This analysis is based on the viewport data for 267,210 page views on an online news website from Yahoo. Viewport time for article header (usually a title which may include small image thumbnail), body (main body of the article), and comment block. Percentage of the total viewport time spent viewing one of the above mentioned regions. Comment clicks showing the number of clicks on the comment block. Dwell time and viewport time on head, body and comment increase from Bounce to Complete. We also note that the distribution of the percentage of time among these blocks changes in an interesting manner. The viewport time on head steadily decreases from 0.31 for Bounce to 0.09 for Complete indicating that users spend an increasing amount of time reading content deeper in the article. The percentage of article read steadily increases from Bounce to Complete, as expected. With respect to this, Bounce (12%) and Shallow (23%) clearly represent low levels of engagement with the article, since less than 25% of the article was read. On the other hand, Deep and Complete correspond to the situations when the majority (83%) of the article was read. The number of comment clicks is highest for Complete (3.14), followed by Shallow (0.43), suggesting that users may engage with comments even if they do not read a large proportion of the article. Finally, we compute the average viewport time at varying vertical position. Each of the four curves corresponds to one of the engagement levels. For the page views in the Bounce case, users rarely scroll down the page, whereas many users in the Shallow case spend approximately another 5 seconds of viewport time at lower scroll positions. 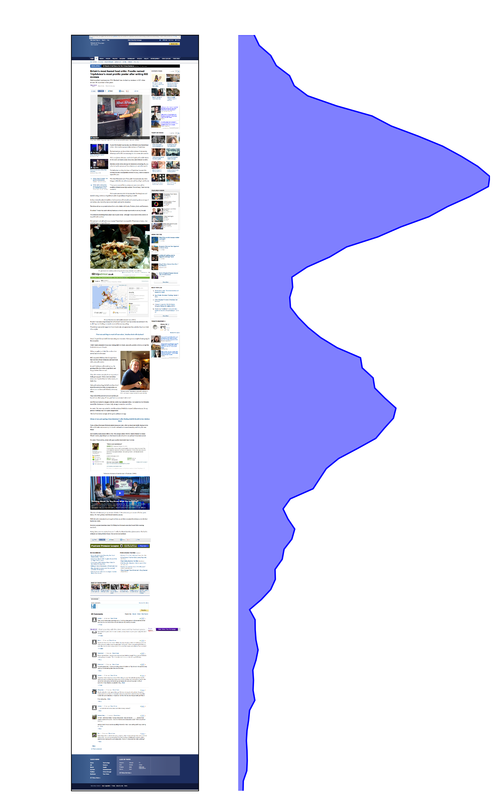 Deep engagement is characterized by significant time spent on the entire article (peak at the first screen amounts to about 50 seconds) with a steady position decay of the viewport time towards the bottom. Interestingly, the viewport time profile for Complete engagement no longer monotonically decays with the position; instead it has a bi-modal shape. This could be due to a significant time users spend viewing and interacting with comments, which are normally placed right after the main article content. Our analysis shows that the proposed four user engagement levels are intuitive, and bring more refined insights about how user engage with articles, than using dwell time alone. We recall that the engagement levels can be derived using the viewport time information, which can be computed through scalable and non-intrusive instrumentation. In a future blog post, I will describe how viewport time can be used to predict these levels of engagement based on the textual topics of a news article. D. Lagun and M. Lalmas. Understanding and Measuring User Engagement and Attention in Online News Reading, International Conference On Web Search And Data Mining (WSDM 2016), San Francisco, USA, 22-24 Fabruary 2016. This is the first blog post on a paper that will be presented at WSDM 2016 , on metrics of user engagement using viewport time. This work is in collaboration with Dmitry Lagun, and was carried out while Dmitry was a student at Emory University, and as part of a Yahoo Faculty Research and Engagement Program. Figure 1 (a): Example page showing the most common pattern of user attention, where the reader attention decays monotonically towards the bottom of the article. Figure 1 (b): Example page showing an unusual distribution of attention, indicating that content positioned closer to the end of the article attracts significant portion of user attention. Online content providers such as news portals constantly seek to attract large shares of online attention by keeping their users engaged. A common challenge is to identify which aspects of the online interaction influence user engagement the most, so that users spend time on the content provider site. This component of engagement can be described as a combination of cognitive processes such as focused attention, affect and interest, traditionally measured using surveys. It is also measured through large-scale analytical metrics that assess users’ depth of interaction with the site. Dwell time, the time spent on a resource (for example a webpage or a web site) is one such metric, and has proven to be a meaningful and robust metric of user engagement in many contexts. In (a) users spend most of their time towards the top of the page, whereas in (b) users spend significant amount of time further down the page, likely reading and contributing comments to the news articles. Although the dwell time for (b) is likely to be higher (the data indeed shows this), it does not tell us much about user attention on the page, neither it allows us to differentiate between consumption patterns with similar dwell time values. A strong tendency to spend more time on interesting articles rather than on uninteresting ones. A very weak correlation between article length and associated reading times, indicating that most articles are only read in parts, not in their entirety. When these two correlate, they do so only to some extent, suggesting that users have a maximum time-budget to consume an article. The presence of videos and photos, the layout and textual features, and the readability of the webpage can influence the time users spend on a webpage. However, dwell time does not capture where on the page users are focusing, namely the user attention. Hence, the suggestion of using other measurements to study user attention. Studies of user attention using eye-tracking provided numerous insights about typical content examination strategies, such as top to bottom scanning of web search results. In the context of news reading, gaze is a reliable indicator of interestingness and correlates with self-reported engagement metrics, such as focused attention and affect. However, due to the high cost of eye-tracking studies, a considerable amount of research was devoted to finding more scalable methods of attention measurement, which would allow monitoring attention of online users at large scale. Mouse cursor tracking was proposed as a cheap alternative to eye-tracking. Mouse cursor position was shown to align with gaze position, when users perform a click or a pointing action in many search contexts, and to infer user interests in webpages. The ratio of mouse cursor movement to time spent on a webpage is also a good indicator of how interested users are in the webpage content, and cursor tracking can inform about whether users are attentive to certain content when reading it, and what their experience was. However, despite promising results, the extent of coordination between gaze and mouse cursor depends on the user task e.g. text highlighting, pointing or clicking. Moreover, eye and cursor are poorly coordinated during cursor inactivity, hence limiting the utility of mouse cursor as an attention measurement tool in a news reading task, where minimal pointing is required. Thus, we propose to use instead viewport time to study user attention. Viewport is defined as the position of the webpage that is visible at any given time to the user. 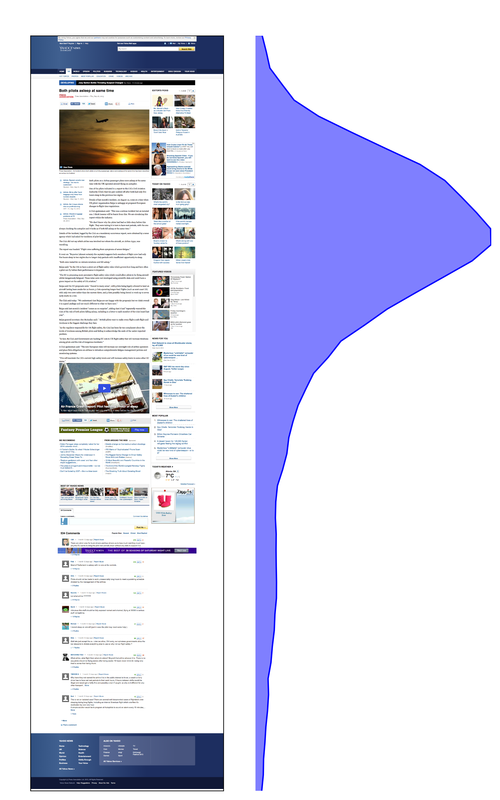 Viewport time is the time a user spends viewing an article at a given viewport position. Viewport time has been used as an implicit feedback information to improve search result ranking for subsequent search queries, to help eliminating position bias in search result examination, and to detect bad snippets and improve search result ranking in document summarization. Viewport time was also successfully used to infer user interest at sub-document level on mobile devices, and was helpful in evaluating rich informational results that may lack active user interaction, such as click. Our work adds to this body of works, and explores viewport time, as a coarse, but more robust instrument to measure user attention during news reading. Figure 2. Distribution of viewport time averaged across all page views. Figure 2 shows the viewport time distribution computed from all page views on a large sample of news articles. 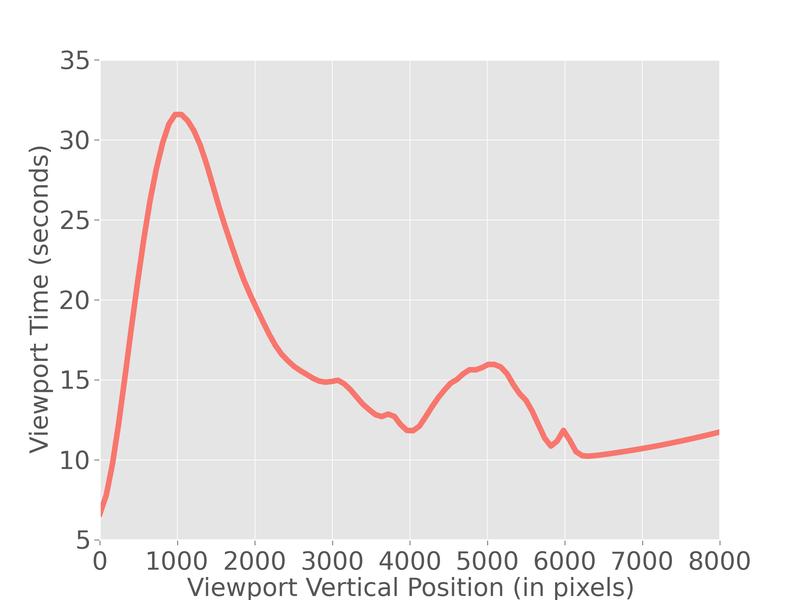 It has a bi-modal shape with the first peak occurring at approximately 1000 px and the second, less pronounced peak at 5000 px, suggesting that most page views have the viewport profile that falls between cases (a) and (b) of Figure 1. This also shows that on average user spends significantly smaller amount of time at lower scroll positions – the viewport time decays towards the bottom of the page. The fact that users spend substantially less time reading seemingly equivalent amount of text (top versus bottom of the article) may also explain the weak correlation between article length and the dwell time reported in several works. Although users often remain in the upper part of an article, some users do find the article interesting enough to spend significant amount of time at the lower part of the article, and even to interact with the comments. Thus, some articles entice users to deeply engage with their content. In this paper, we build upon this observation and employ viewport data to develop user engagement metrics that can measure to what extent the user interaction with a news article follows the signature of positive user engagement, i.e., users read most of the article and read/post/reply to a comment. We then develop a probabilistic model that accounts for both the extent of the engagement and the textual topic of the article. Through our experiments we demonstrate that such model is able to predict future level of user engagement with a news article significantly better than currently available methods. I worked for several years with Janette Lehmann as part of her PhD looking at user engagement across sites. This blog post describes our work on inter-site engagement in the context of online news reading. The work was done in collaboration with Carlos Castillo and Ricardo Baeza-Yates . Online news reading is a common activity of Internet users. Users may have different motivations to visit a news site: some users want to remain informed about a specific news story they are following, such as an important sport tournament or a contentious important political issue; others visit news portals to read about breaking news and remain informed about current events in general. While reading news, users sometimes become interested in a particular news item they just read, and want to find more about it. They may want to obtain various angles on the story, for example, to overcome media bias or to confirm the veracity of what they are reading. News sites often provide information on different aspects or components of a story they are covering. They also link to other articles published by them, and sometims even to articles published by other news sites or sources. An example of an article having links to others is shown on the right, at the bottom of the article. Story-focused reading exists, and is not a trivial phenomenon. This type of news reading differs from a user daily consumption of news. Story-focused reading is not simply a consequence of the fact that some stories are more popular, have more articles written about them, or covered by more news providers. Story-focused reading is driven by the interest of the users. Even users that can be considered as casual news readers (they only read few articles) engage in story-focused reading. When engaged in story-focused reading, users spend more time reading and visit more news providers. Only when users read many articles about a story, the reading time decreases. Our analysis suggests that this could be due to news articles containing mostly the same information. The strategies that readers employ to find articles related to a story depend on how deep they want to delve into the story. If users are only reading a few articles about a story, they tend to gather all information from a single news site. In the case of deeper story-focused reading, where users are interested in the story details or specific information, they often use search and social media sites to access sites. Furthermore, many users are coming from less popular news sites and blogs, which makes sense, because blogs frequently link their posts to mainstream news sites when discussing an event and users are following these links to likely gather further information or confirm the veracity of what they are reading. It leads to a longer period of engagement (reading sessions are longer) and earlier re-engagement (shorter absence time). Providing links to external content does not have a negative effect on user engagement; the period of engagement remains the same (reading sessions are the same), and the re-engagement begins even sooner (shorter absence time). This does not mean that news providers should just provide links; they should provide the right ones in terms of quantity and quality. The type, the position, and the number of links play an important role. Users tend to click on links that bring them to other news articles within the same news site, or to articles published by less known sources, probably because they provide new or less mainstream information. However, it is not a good strategy to offer too many such links, as this is likely to confuse or annoy users. Too many inline links can have detrimental effect on users’ reading experience. Finally, when engaged in story-focused reading, users tend to click on links that are close to the end of the article text. The linking strategies of news providers affect the way users engage with their news sites, which by itself is not new. However, our results are in contradiction with the linking strategy that aims at keeping users as long as possible on a site by linking to other content on the site. Instead, it can be beneficial (long-term) to entice users to leave the site (e.g., by offering them interesting content on other sites) in a way that users will want to return to it. Such information could be integrated in the personalised news recommender of the news site. Story-related articles in the news feed could be highlighted or content frames containing information and links related to the story could be presented on the front page. It might be also beneficial to provide and link to topic pages containing latest updates, background information, blog entries, eye witness reports, etc. related to the story. Story-focused reading also brings new opportunities for news providers to drive traffic to their sites by collecting the most interesting articles and statements around a story, i.e., becoming a news story curator, and publishing them via social media channels or email newsletters. J. Lehmann, C. Castillo, M. Lalmas and R. Baeza-Yates. Story-focused Reading in Online News and its Potential for User Engagement, Journal Of The Association For Information Science And Technology (JASIST), 2016. Since September 2013, I have been working on user engagement in the context of native advertising. This blog post describes our first paper on this work, published at the Industry Track of ACM Knowledge Discovery & Data Mining (KDD) conference in 2015 . This is work in collaboration with Janette Lehmann, Guy Shaked, Fabrizio Silvestri and Gabriele Tolomei. Feed-based layouts, or streams, are becoming an increasingly common layout in many applications, and a predominant interface in mobile applications. In-stream advertising has emerged as a popular online advertising because it offers a user experience that fits nicely with that of the stream, and is often referred to as native advertising. In-stream or native ads have an appearance similar to that of the items in the stream, but clearly marked with a “Sponsored” label or a currency symbol e.g. “$” to indicate that they are in fact adverts. A user decides if he or she is interested in the ad content by looking at its creative. If the user clicks on the creative he or she is redirected to the ad landing page, which is either a web page specifically created for that ad, or the advertiser homepage. The way user experiences the landing page, the ad post-click experience, is particularly important in the context of native ads because the creatives have mostly the same look and feel, and what differs mostly is their landing pages. The quality of the landing page will affect the ad post-click experience. The two most common measures used to quantify time spent on a site are dwell time and bounce rate. Dwell time is the time between users clicking on an ad creative until returning to the stream; bounce rate is the percentage of “short clicks” (clicks with dwell time less than a given threshold). On a randomly sampled native ads served on a mobile stream, we showed that these measures were indeed good proxies of post-click experience. We also saw that users clicking on ads promoting a positive post-click experience, i.e. small bounce rate, were more likely to click on ads in the future, and their long-term engagement was positively affected. Focusing on mobile, we found that a positive ad post-click experience was not just about serving ads with mobile-optimised landing pages; other aspects of an landing page affect the post-click experience. We therefore put forward a learning approach that analyses ad landing pages, and showed how these can predict dwell time and bounce rate. We experimented with three types of landing page features, related to the actual content and organization of the ad landing page, the similarity between the creative and the landing page, and ad past performance. The later type were best at predicting dwell time and bounce rate, but content and organization features performed well, and have the advantages to be applicable for all ads, not only for those that have been served. Finally, we deployed our prediction model for ad quality based on dwell time on Yahoo Gemini, an unified ad marketplace for mobile search and native advertising, and validated its performance on the mobile news stream app running on iOS. Analyzing one month data through A/B testing, returning high quality ads, as measured in terms of the ad post-click experience, not only increases click-through rates by 18%, it has a positive effect on users: an increase in dwell time (+30%) and a decrease in bounce rate (-6.7%). This work has progressed in two ways. We have improved the prediction model using survival random forests and considered new landing page features, such as text readability and the page structure . We are also working with advertisers to help improving the quality of their landing pages. More about this in the near future. M. Lalmas, J. Lehmann, G. Shaked, F. Silvestri and G. Tolomei. Promoting Positive Post-click Experience for In-Stream Yahoo Gemini Users, 21th ACM SIGKDD International Conference on Knowledge Discovery and Data Mining (Indutsry Track), Sydney, Australia, 10-13 August 2015. N. Barbieri, F. Silvestri and M. Lalmas. Improving Post-Click User’s Engagement on Native Ads via Survival Analysis, 25th International World Wide Web Conference (WWW 2016), Montreal, Canada, 11-15 April 2016.